Laboratoire d'Informatique de Paris 6, Université Pierre et Marie Curie, Paris, France. This book contains a collection of articles presented at the international workshop on Computation for Metaphors, Analogy and Agents, held in 1998 at the University of Aizu in Japan. The originality of this book is to bring together various research fields where metaphor and analogy have emerged. These domains include linguistics, robotics, computer science, cognitive science, psychology and mathematics. After Chrystopher Nehaniv's introduction, this book is split into seven chapters. The first section, metaphors and blending, deals with the mental processes used to understand a metaphor or an analogy. The second section, embodiment: the first person, adopts an agent-centred viewpoint. It studies the notions of embodiment and coupling between agent and environment. After this agent-centred viewpoint, the relatedness of the first person to others is the theme of the third part, interaction: the second person. The next part of the book, imitation: first and second person, brings the agents together in terms of relationships they may have to each other. The next two sections, situated mapping: space and time and algebraic engineering: respecting structure, share the concern of structure preservation. The last part, a sea-change in viewpoints, presents an objectivist perspective on the first and the second person viewpoints. The first part of this book deals with the mechanisms of metaphors and blending. In the first paper, Mark Turner introduces the theory of conceptual integration. Conceptual integration is the mental process at the root of our capacity to create meaning, for example by using analogy or metaphor. Conceptual integration consists in the creation of a new mental space (the blend) from the projection of elements and relations of, at least, two input mental spaces (also called contributing spaces). The operations of composition (of elements in the blend), completion (of the blend by recruitment of other frames) and elaboration (dynamical elaboration of the structure in the blend) develop an emergent structure that is not available from the contributing spaces. The new blend structure leads to the construction of new meaningful connections. Analogy emerges from dynamic forging of analogues, connections and blends thanks to a network of spreading coherence. The meaning is then forged, with continual revision and backtracking, in the blend rather than merely transferred between domains by mapping. Masako K. Hiraga illustrates the previous framework of Turner and Fauconnier for understanding poetic creativity in general and metaphors in haiku (a form of Japanese traditional poetry) in particular. In the last paper of this section, Tony Veale presents a more computational view of the mechanics of building and understanding metaphors, especially visual metaphors and analogies. The computational model Sapper is close to the Turner and Fauconnier theory, particularly in the construction of a distinct third space with its own reality, thanks to bridge relations between the initial concepts. Veale underlines the pragmatic and computational uses of the model of blend recruitment. The second part of the book, embodiment: the first person, is based on the agent itself. The main common point of the two papers is to place the agent in its environment: the environment must be used as a tool for building, organising and manipulating knowledge. Brooks and his team present Cog, the humanoid robot from M. I. T. This ambitious project has two general goals. The first is an engineering goal, with the exploration of the issues involved in building a fully integrated humanoid. The second goal is to understand human cognitive abilities well enough to build a robot that acts similarly to a person with coherent global behaviour. This project questions classical Artificial Intelligence approaches about human intelligence and brings up the importance of development, of social interactions, of physical embodiment and of the integration of multiple sensory and motor systems. The paper describes the current hardware and software environments and then the current tasks and behaviours implemented. In the second paper, Stovanov presents general mechanisms for internalisation of environment in behaviour-based autonomous agents. As with Piaget's developmental psychology, the agents have inborn schemas, providing them with ordered sequences of elementary actions. When an agent acts, the environment constrains the enabled schema instances. As for children, processes of assimilation and accommodation occur and the original schemas may change. The agent knows its environment via the modifications of its schemas, which metaphorically stand for its past experiences. The third part of the book, interaction: the second person, considers the agent situated in a social environment and presents some means of giving the agent the possibility to interact and communicate with others. First, Dautenhahn grounds cognition (memory and knowledge) in an evolutionary level. Memory is not just made up of some lists of static items, somewhere in the mind, but it is the result of an evolutionary (dynamical and constructive) process: previous experiences are reconstructed with the actual body and concrete context as the points of reference. She defines the concept of autobiographic agents as embodied agents that dynamically reconstruct their individual 'histories' during their lifetimes. In this way, embodiment becomes a key concept in building physical agents (robots), but Dautenhahn also raises the issue of embodiment for virtual agents. Next, she deals with the issue of social agents, relating it to sociobiology and evolutionary considerations on the origin of social behaviour as social intelligence, or social organisation and control. She ends her paper with a description of the Aurora project in which robots are used to help autistic children in social interactions. 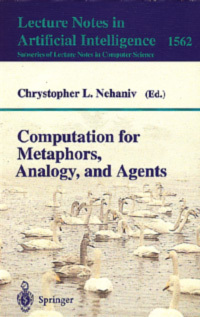 As metaphor is central to language and thought, papers by Barnden and O'Neill-Brown present frameworks which allow a computational system (an agent) to have metaphor-based reasoning, and so to generate and process metaphors. As we have seen, agents have to interact with each other, but they also have to communicate with humans, and that is the topic of Fenton-Kerr's paper: GAIA (Graphic Audio Interface Agent) is a multi-modal agent used in a pedagogical context. The agent has to enhance a learning experience by providing contextual clues though graphic or audio interfacing. The paper raises important points for agent interfaces. The first is how to represent the agent and how the user will sense it. Next, the agent characterisation and the personalised responses of the system seem to be factors in the user's motivation. The last problem is the choice of the most appropriate mode or modes for interaction. The main purpose of the next part, imitation: first and second person, is to study how agents learn from each other, and especially how they acquire social abilities. We again find Cog, the M. I. T. humanoid robot discussed by Scassellati. The goal here is for Cog to acquire mechanisms of joint attention and imitation allowing it to succeed in its social behaviour. (Joint attention is the ability to selectively attend to an object of mutual interest.) Scassellati draws on the work of developmental psychologists and concludes that it is possible to decompose complex social skills in simpler behavioural skills. The mechanism of joint attention is then the composition of four simpler skills: maintaining eye contact, gaze following, imperative pointing and declarative pointing. The author explains how to build these skills by using human-like sensory systems and motor abilities. Kauppinen's paper is about learning language. The author shows that imitation and analogy are crucial principles in the acquisition of language. Children acquire figures of speech, at first typically rigid imitations and repetitions, but little by little these figures become more flexible and variable. After a while, children learn to use them in new contexts parallel to the original situation. The next two parts, situated mapping: space and time, and algebraic engineering: respecting structure, share the fundamental concept of structure preservation. Nehmzow presents the "episodic mapping" paradigm used for the self-localisation of autonomous mobile robots. This work is based on a Kohonen network with two layers: one to identify the current position within the mapping of the environment based on current perceptions of the word, the second to cluster the already clustered sensory information encoded in the first layer. Shinohara analyses the motion-time metaphors in English and in Japanese and shows the similarities between the conceptualisation of time and spatial motion. Goguen's paper is an extensive introduction to the use of algebraic semiotics in user interface design. The algebraic semiotics approach intends to study sign systems and their representations with the aim of improving aspects of communication and cognition, such as designing and understanding interfaces or co-ordinating information in different media. The main points of this theory are as follows. Firstly, signs are always parts of sign systems (Saussure). Secondly, meanings are not directly attached to signs, but signs mediate meaning (Peirce). Thirdly, representations (as user interfaces) are mappings between sign systems. In the same way, Indurkhya outlines some algebraic mechanisms that can be used to formalise the creative aspects of metaphor. These two parts finish with a paper by Alty and Knott, which presents a framework for investigating the mapping between metaphors and human-computer interfaces. Their aim is that this framework should assist the designer in the interface design process. The last part of the book, a sea-change in viewpoints, brings in an external perspective to for the consideration and analysis of agents and metaphors. Beynon describes Empirical Modelling, a new framework that he introduces as an alternative to the logicist tradition in Artificial Intelligence. Nasuto's paper postulates the adoption of a communication metaphor rather than a computer metaphor in constructing neural networks. In his opinion, the most important properties of neurons are their ability to select different parts of converging signals and the capability to choose which signals to consider in the first place. In this way, neurons have spatio-temporal filtering capacity: information for one neuron can be noise for another. The neurons' behaviours are then based upon the information encoded in spike trains. The authors uses this viewpoint in building NESTOR (the NEural STochastic diffusion search netwORk). NESTOR is an artificial retina and a new model of visual attention. Nehaniv concludes the book by stressing the subjectivity of meaning: meaning only makes sense from the standpoint of observers. This book is built around three perspectives for consideration of agents. The first person (intra-agent perspective) refers to the experience of an agent itself, in relation to its environment, embodiment, actors and sensors. The second person (inter-agent perspective) refers to the experience by an agent of other agents and of the interaction dynamics with other agents. The third person is then the observer perspective, an extra-agent perspective. In summary, this book presents an interesting multi-disciplinary approach to the fields concerned with metaphor, analogy and agents, such as linguistics, psychology, computer science and mathematics. This book is a good source of important references in these fields for both theoretical and applied approaches. As the journal for which this review is written deals with artificial societies and social simulation, all the papers about embodiment and interaction in agent societies are particularly relevant, especially that by Dautenhahn. However, because of the multi-disciplinary aspect of the topics presented, some papers fail to give a balanced view of all the subjects they broach. The complexity of some issues involved is also likely to leave lay readers in the dark.